If you’ve just started venturing into the golf world, it’s important to find a club set that suits your playing style. Beginners are often regarded as high handicap players because they haven’t mastered the art of golf just yet. These players haven’t honed their skills yet, but that doesn’t mean that shouldn’t be able to play with the big dogs. Clubs designed for beginners allow new golfers to achieve great results despite a lack of polished technique. They cater to lower skill sets, but they’re not made to be used forever. In fact, using a beginning golf set will allow you to improve your skills tremendously. They teach players proper technique by giving them a better idea of what it’s like to hit the ball correctly. Players are able to get great distance and accuracy consistently with every shot, regardless of their proficiency. Here are some of the best golf club sets for beginners. This set from Pinemeadow Golf has all of the game improving clubs you need to be successful. The driver is titanium enhanced and has a loft of 10.5 degrees, ensuring that your shots are far and powerful. The fairway wood has 15 degrees of loft while the hybrid has 21. Both have a flexible graphite shaft that increases power during your swing for maximum impact. It includes steel irons 4 through 9 and a pitching wedge. Each iron has a wide clubface and perimeter weighting to improve your accuracy. Overall, the set has 16 pieces including a standing bag. From Wilson is this affordable and effective set for beginners. 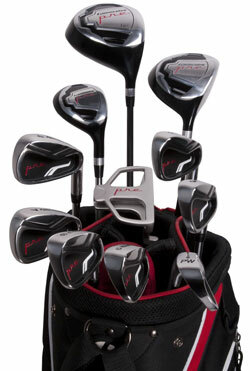 The set includes a driver, putter, 3 fairway wood, 4 hybrid, and a collection of irons. 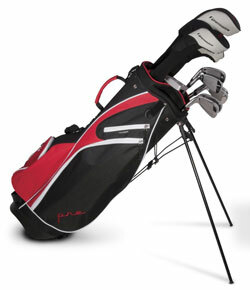 It also comes with the bag and club covers to protect the set when not in use. Graphite shafts are used in the driver and fairway wood for increased strength and flexibility. The irons are all made from stainless steel and are designed to be forgiving. This is achieved with a higher loft and large clubface compared to traditional models. They also have a high moment of impact, resulting in better accuracy and distance. With its modest price, it’s perfect for those just getting into the game. This set contains all of the basics you need with game improving designs. It contains 9 clubs in total. The 460cc driver is made with a large sweet spot. The large clubhead and heavy mass make it possible to drive the ball quite far, regardless of how you hit the ball. The fairway woods and hybrids have a high loft and aerodynamic shape for greater heights and distance. The mallet putter has a T-style design. It’s offset for better accuracy and ultimate control when you putt. The set is housed in a stand bag for easy transport. Callaway has created this ultimate set for new golfers that are serious about seeing improvement. It has 18 pieces in total, including 12 clubs designed to refine your game. The driver is made from high-quality titanium. It has a considerably large head made for maximum forgiveness as you tee off. The irons and wedges have high flight technology. This means that they have a low center of gravity, high loft, perimeter weighting, and a back cavity for outstanding control. A precision milled putter with an offset head completes the set. Of course, everything is contained in a durable bag. This set is specifically designed to improve a golfer’s skill by harnessing their raw power and strength. Made by Wilson, it’s made with beginners in mind and aims to get novice players to stick with the game and develop their skills. Their main goal is to produce distance. This is achieved with large clubheads, perimeter weighting, and many other design elements. They also have high moments of impact to give you the best results from a powerful swing. It has 14 pieces in total, including the backpack style bag a head covers. Beginner golf clubs can be hard to spot to the untrained eye. However, these clubs are carefully designed to improve your shot. Small changes can drastically affect your success. Generally, you’ll want to go with clubs that have maximum forgiveness. This means that they compensate for poor position and technique. These general considerations should be applied to an entire set and individual clubs alike. Offset club heads will improve your shot a number of ways. To be considered offset, the clubhead has to be positioned slightly away from the shaft. The hosel is used to achieve the offset, allowing the clubface to hit the ball slightly later than normal. While tiny, this change results in a different position of the club. It’ll make the head open when you make contact with the ball, making it fly farther and more accurately. It also helps avoid hitting the ground, which is far too common with beginners. Your hands will naturally move more forward on the grip, improving your technique drastically. Large, oversized faces are ideal for beginners because they provide a larger surface area to hit the ball. Furthermore, every club has a sweet spot. This spot on the face is where you want to hit the ball to get the best trajectory and distance. Most golfers work for years to get to the point where they can effortlessly hit this spot. For a beginner, it’s not so easy. A larger club face increases this sweet spot and amends shots that are off. In addition to a larger face, perimeter weighting is something to look for. Perimeter weighting refers to added mass around the edges of the face. In some cases, the area behind the face is hollowed out so that the extra weight can be relocated to the perimeter. 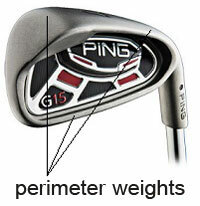 When coupled with a larger club face, perimeter weighting can do wonders to improve your accuracy. If you hit the toe or heel of the club rather than in the middle, the extra mass will still send your ball flying. Without it, the shot will not be accurate because the ball didn’t make contact with something solid. The sole refers to the bottom of the club head. Soles are usually flat, allowing you to set the club flush on the ground. Beginners clubs utilize wide soles to improve height and distance. A wider sole cuts through the grass much better, resulting in less resistant that could change the head’s position as you swing. Club length also plays a big role in success. While there are a number of different measurements involved when choosing the perfect club, it’s a good idea for beginners to start with shorter options. This helps avoid hitting the ground and ensures solid contact with the ball. Whether you’re assembling a set from scratch or simply improving your arsenal one by one, it’s important to know what to look for in each type of club. When it comes to choosing a fairway wood, the club’s loft is key. Hitting from the fairway requires great height and distance to be successful. Beginner’s hybrids and woods tend to have more loft. Loft refers to the angle of the clubface. The higher the loft, the more trajectory you will achieve. They also help prevent the ball from curving too much in the air by improving backspin. In addition to a high loft, these clubs have a low center of gravity. This gives you more power and control for the best shot possible. The things to look for in the perfect beginner driver is a large club face and a high loft. Drivers are the largest in a set and are designed to get the most distance. With a large club face, you reduce the chances of a mishit. The sweet spot is increased. A loft rating of at least 12 degrees will give you height and reduce curve. Another thing you can look for is a flexible shaft, as it will give you more power and swing speed upon impact. Graphite shafts are particularly useful if you don’t have the fastest swing just yet. Putting can be one of the most difficult parts of golf. In fact, it’s not uncommon for new golfers to go over par due to repeated putts. 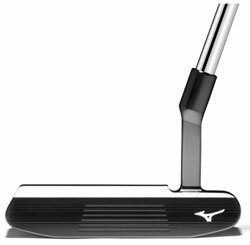 The best type of putter for beginners has a mallet head. These have larger clubfaces and are square in shape. An offset is also recommended. Many beginner putters have lines to help you set up your shot. To be successful, you need to look at the ball directly from above. The offset clubhead and guidelines make this task a bit easier until and help you improve your technique before you move onto traditional blade putters. Irons are used frequently in a game of golf, so many manufacturers have designed game improving options perfect for beginners. They offer the entire range of irons with immense design changes. These include back cavities, perimeter weighting, and a large clubface. Clubs with a high loft and low center of gravity will help you successfully get out of most situations, whether it’s shots in the rough or a sand hazard. Wide soles are also used to improve the club’s movement through various terrains. You don’t have to be a pro to enjoy golf. Every golfer starts off at the bottom and must hone their technique to improve. 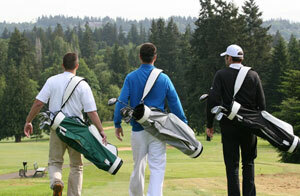 Golf clubs designed for beginners teach you how to upgrade your proficiency. You’ll see great progress over time by continually using these clubs. They help you recover from minor mistakes in your aim and swing to make your accuracy, distance, and power that much better.